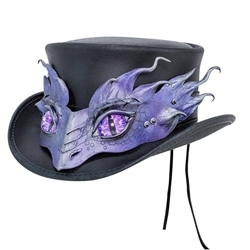 This Leather Dragon Top Hat is made in the US from the finest materials. The hatband features a dragon's face with piercing glass eyes and laced closure. A breathtaking showpiece, the hatband is removable for those times you require a more low-key topper. Measure the circumference of your head half way up your forehead and one finger's width above your ears. Pull the tape to about the tightness you would like to wear a hat. You can use a string and then measure it with a ruler if you don't have a tape. Be sure not to pull the tape or string too tight, this is the most common error people make when figuring out their hat size. A good fitting hat feels snug and secure, not tight or pinching. Sizes are approximate and will vary with hat style and material. If unsure about your size, it's best to choose a larger size.